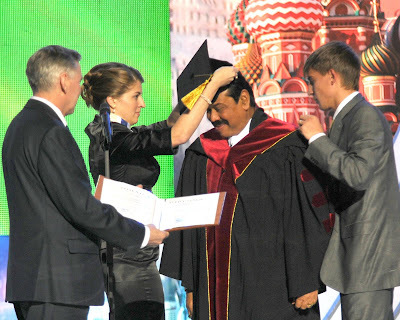 Feb 06, Moscow: The People Friendship University of Moscow in Russia (former Patrice Lumumba University) Saturday conferred a Honoris Causa Doctorate on Sri Lanka President Mahinda Rajapaksa in a ceremony held at the Kremlin Conference hall to celebrate the 50th anniversary of the University. Here the Rector of the University Professor Vladimir M. Filippov presents the President with a diploma. President Rajapaksa addressed the audience following the conferment.